Nothing is sweeter than a baby girl, and I was lucky enough to have had the opportunity to throw a couples baby shower for my longtime friend, Emily, her husband Tommy and their future baby girl! My friend, Tiffany, and I planned and threw this couples baby shower - neither of us had thrown a couples shower before, so we had to challenge ourselves to think out of the box. We didn't want to make the shower seem to girly, even though the couple is having a girl. We were conscience of the fact that both women and men would be present at the shower - we wouldn't want the men to feel uncomfortable with too much girl talk or too many frills! I think this gift received by the couple appropriately summed up the tone for this couples shower and was perfect for the sports loving dad ... "I watch ESPN with my Daddy" with a tutu booty and football leg warmers! A perfect gift for a shower that involves both the mom and dad! To start planning, we determined our theme, with the couples help. A cookout with yard games seemed like the best option for our co-ed guests. But, we, of course, couldn't have thrown a baby shower without baby-related invitations, games and décor! The design of the invitation was simple and contemporary - a bit abstract ... 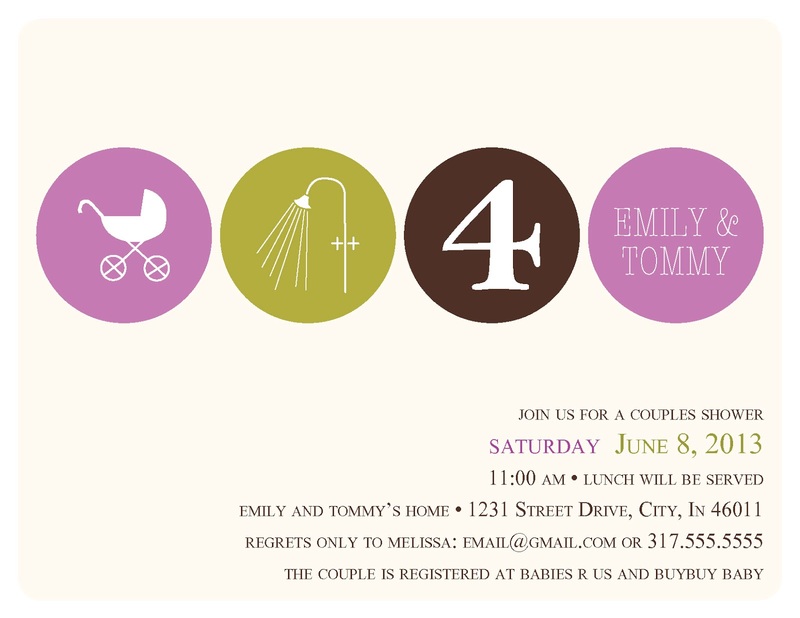 The icons spell out "Baby Shower For Emily and Tommy". I designed using the colors from the bedding the couple had chosen for their little girl, but stayed away from bows, flowers and the super girly stuff since this is a co-ed shower. I love the look of this invitation! We didn't need to do too much in terms of décor for this shower, since a large part of it was held outside. Tiffany tackled a beautiful diaper cake for the main kitchen table that turned out perfect! I think she needs to go into business for herself. Since we were having a cookout, the food was pretty easy to plan - hamburgers and hot dogs on the grill, cheesy potatoes, veggies and dip and chips. Tiffany also created these adorable cupcake bouquets! She baked the cupcakes and attached them to a styrofoam ball sitting in a pot using toothpicks. We decided to have two activities - no games. Since people were going to be busy playing yard games, eating and chatting, we didn't find it as appropriate to play games. You may have seen a similar idea from one of my earlier blog posts ... we created cards with pre-printed text and blanks, and we had the guests guess the baby's name (since the mom and dad aren't revealing it yet), predict the due date, weight and length, and write a wish to the new baby. We compiled the filled-in cards and bound them with a jump ring. I nice memento for the baby book! The second activity involved writing a message to the parents on diapers. The idea was to leave a comforting or funny message on the diapers that the parents will use to change their new little girl - something to help ease the pain of multiple diaper changes, especially those late at night. We filled a basket with diapers and wrote out two example diapers to give the guests some ideas to get started. We then passed around diapers and sharpies and the guests wrote their messages. As favors, we filled small baby bottles with skittles and tied a little tag around them thanking the guests for coming to the shower. I was able to utilize elements of the invitation design for the tags. Overall, our first couples shower was a success. By keeping it casual and keeping our guests in mind, we were able to celebrate the parents and their future baby girl in a way that made everyone feel welcome. I look forward to meeting this new little one in July. I am so happy that these two deserving parents are being blessed with a sweet little girl, and I know they will make such wonderful parents! Good one! I needed a post like this. I am very confused as to what theme to keep for my best friend’s baby shower. I have booked a beautiful event space Chicago that even has a beautiful view. I know my best friend and she is going to love it. Thanks for sharing this helpful post.